Former U.S. Speaker of the House Tip O’Neill was best-known for his legendary slogan “all politics is local.” In essence, he was saying that one can only be a successful politician if one is able to respond to the everyday concerns of constituents. The complicated theories that often dominate political science classes and policy think tank discussions do not matter to the average citizen. Ultimately, people care most deeply about the issues they face every day rather than ideological warfare. Indonesia’s recent decision to cut its gasoline fuel subsidy is an excellent example of this. On November 18, 2014, President Jokowi followed through with his promise to cut the subsidy, thus fulfilling a campaign pledge, which his opponents regularly criticized. [i] The expected large-scale protests failed to materialize, although this is subject to change if global oil prices surge. Unfortunately, there is still a lack of knowledge about the reasoning or the potential benefit of these cuts. This article seeks to correct this by examining how these subsidies functioned, the rationale for cutting them, and the long-term benefits of eliminating fuel subsidies in Indonesia. 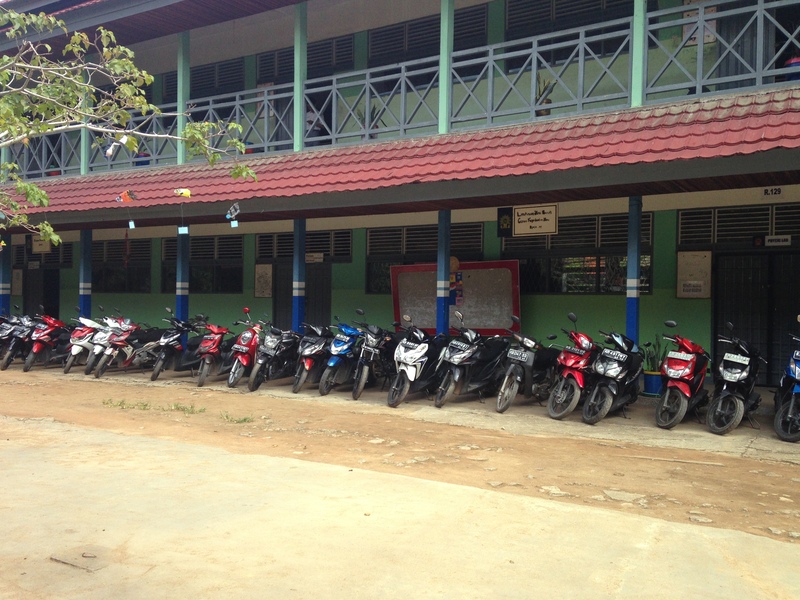 The rising of oil prices are felt by most Indonesians, including the vast amount of students who drive their own motorbikes to school everyday. In 2012, the Indonesia federal government spent over twenty percent of its annual budget on subsidizing energy. [iv] To put this into better perspective, this is three times the amount the government spent on improving and maintaining infrastructure, such as electricity, roads, etc. Eliminating or decreasing fuel subsidies has been discussed in Indonesia for a long time, but Jokowi’s move was necessitated by the increasingly fiscally untenable subsidy, as demonstrated by the graph below. The drastic drop in the price of oil left Indonesia a big winner as it allowed the government to drastically curtail subsidies without a large price shock. [v] Ultimately, most observers agree that the fall in oil prices is due to less demand due to a global economic slowdown and to more supply. [vi] Eventually the price of oil will self-correct and this author among many others is skeptical that it will remain so low. Unfortunately, our ability to forecast oil prices is rather limited, so Indonesia has to deal with an uncertain future. Indonesia has exhibited prudent fiscal management over the last decade by demonstrating solid economic growth coupled with low budget deficits. [viii] Unfortunately, the volatility of oil prices meant that Indonesia was constantly at risk of oil price shocks, hardly an anomaly over the last decade. [ix] Indonesia only became a net importer of oil about a decade ago and since then has gradually seen its consumption overtake its production, as indicated below. This is not necessarily a bad thing as it demonstrates Indonesia’s robust economic growth as more people are able to buy cars, motorcycles, etc. [x] However, by keeping fuel prices at an artificial low Indonesia was promoting something that “place[d] good economics directly at odds with good politics.”[xi] Energy subsidies are understandably very popular as people benefit directly; however they often miss the hidden costs. Some of Jokowi’s critics have argued that these oil subsidies serve to lessen economic inequality, but this is not necessarily true. Eighty-four percent of the benefits of these subsidies go to the richest fifty percent of the Indonesian population, while forty percent go to the top ten percent. [xiii] There is nothing inherently wrong with more middle and upper-class Indonesians being able to afford to drive more cars and motorcycles, but there is something wrong if takes the form of a regressive tax. Furthermore, these energy subsidies do not promote economic growth and have no beneficial long-term impact. Jokowi has promised to use the immediate savings generated by his cuts to help fifteen million of the poorer Indonesians affected. [xiv] Hopefully, the long-term consequence of these subsidies cuts is more investment in infrastructure that Indonesia needs badly, but only time will tell. This issue remains relevant because it is quite possible that the price of oil will rise again in the near future, which will lead to Indonesians facing higher prices at the pump and possible civil unrest. President Jokowi’s administration has been lucky in the sense that low oil prices prevented large-scale unrest. Past Indonesian political leaders have been wary of cutting energy subsidies as a 1998 fuel price increase helped spark the riots that ended the thirty year reign of President Suharto which demonstrates the potential backlash. [xv] However, it is very important that President Jokowi and future Indonesian leaders remain steadfastly opposed to significant energy subsidies as they are inefficient and counterproductive. Ultimately, their resolve has yet to be tested, but in the coming months and years it will be. [i] Shuli Ren, “Indonesia: Jokowi Hikes Fuel Price, Analysts Cheer,” Barron’s Asia 18 November 2014, http://blogs.barrons.com/asiastocks/2014/11/18/indonesia-jokowi-hikes-fuel-price-analysts-cheer/, accessed 7 January 2015. [ii]“A Citizens’ Guide to Energy Subsidies in Indonesia,” International Institute for Sustainable Development 2011, http://www.iisd.org/pdf/2011/indonesia_czguide_eng.pdf, accessed 7 January 2015. [iv] Ndiame Diop, “Why is Reducing Energy Subsidies a Prudent, Fair, and Transformative Policy for Indonesia,” Economic Premise 136 (2014), 1. [v] “Cheaper Oil: Winners and Losers,” The Economist 25 October 2014, http://www.economist.com/news/international/21627642-america-and-its-friends-benefit-falling-oil-prices-its-most-strident-critics, accessed 19 December 2014. [vi] “Why the Oil Price is Falling,” The Economist 8 December 2014, http://www.economist.com/blogs/economist-explains/2014/12/economist-explains-4, accessed 19 December 2014. [vii] The Indonesian Finance Ministry, “Indonesia’s Cash Drain,” http://www.wsj.com, accessed 8 January 2015. [viii] Diop, “Why is Reducing Energy Subsidies,” 2-3. [x] Yogita Lal and Richard Paddock, “Indonesia Fuel-Subsidy Corruption Sets First Major Test for President-Elect,” Wall Street Journal 21 September 2011, http://www.wsj.com/articles/indonesia-fuel-subsidy-corruption-sets-first-major-test-for-president-elect-widodo-1411284140, accessed 8 January 2015. [xi] Jeffrey Frankel, “The Arguments Against Food and Energy Subsidies,” World Economic Forum 18 August 2014, https://agenda.weforum.org/2014/08/food-energy-subsidies-egypt-india-indonesia/?utm_content=bufferb9675&utm_medium=social&utm_source=twitter.com&utm_campaign=buffer, accessed 8 January 2015. 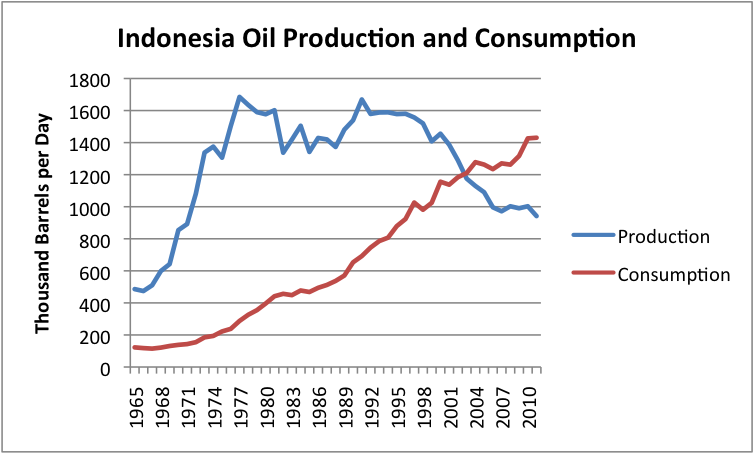 [xii] BP Statistical Review 2013, “Indonesia Oil Production and Consumption,” http://www.crudeoilpeak.info, accessed 7 January 2015. [xiii] Diop, “Why is Reducing Energy Subsidies,” 4. [xiv]Mario Ritter, “Some Asian Countries Gain From Low Oil Prices,” VOA 7 December 2014, http://learningenglish.voanews.com/content/some-asian-countries-gain-from-low-oil-prices/2546134.html, accessed 7 January 2015. [xv]William Pesek, “Oil Subsidies Hold Back Indonesia,” Bloomberg 14 August 2014, http://www.bloombergview.com/articles/2014-08-21/oil-subsidies-hold-back-indonesia, accessed 7 January 2015. January 13, 2015 in News.